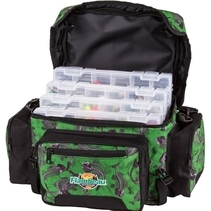 Offers storage galore for the angler on the go. Covered with cutting-edge fish graphics, the bag comes with four Flambeau 4006TT Tuff Tainers that offer an unbelievable amount of storage for your soft baits, terminal tackle, and hardbaits. All along the outside are a number of supplementary storage compartments that are ideal for carrying spools of line, tools, and bags of soft plastics. On the back, the bag is fitted with a rubberized mesh stash pocket that allows quick access to your most often used items. Complete with quick-release buckles, padded shoulder strap. | Color: Camo | Size: Extra large | Dimensions: 16"x11"x9"